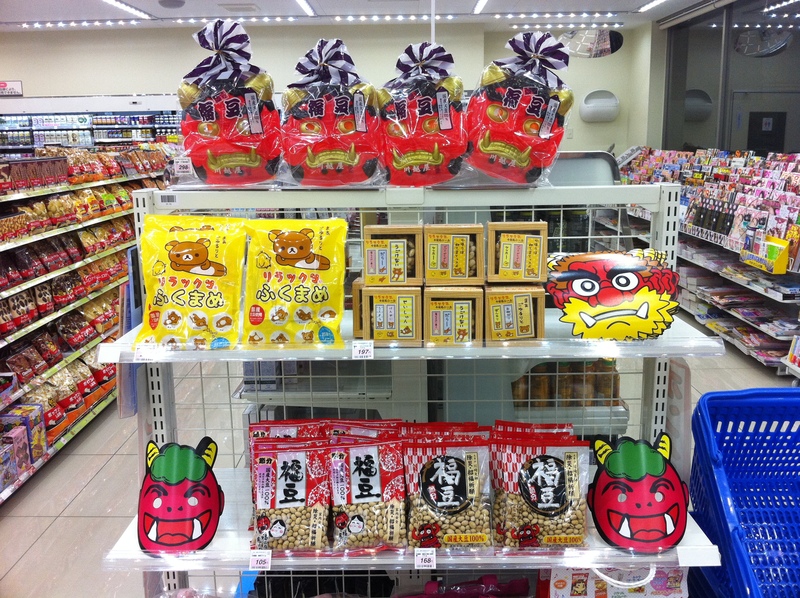 The Setsubun display at our local 7-11 included this Oni/Maki stand for taking your picture with! Today is Setsubun! Our textbook at school translates this as “The Annual Bean Throwing Festival” and states that it is to celebrate the coming of Spring. Japanese people celebrate by throwing roasted soybeans, usually at the father of the household while he wears an Oni or demon mask. You chant “Demons out, happiness in!” and then eat as many beans as your age. It is also traditional to eat an Ehoumaki, or uncut sushi roll, facing the lucky direction of the year. I’m particularly excited this year because while I’ve heard about this holiday for ages, this is my first time to see it in person. When the display went up at Lawson’s, the combini on the corner, I was ridiculously happy to see it. It’s the difference between something I’ve known about for years, read about in books and on the internet, versus finally seeing it in person. Soybeans branded with my favorite characters (Rilakkuma and Mameshiba! 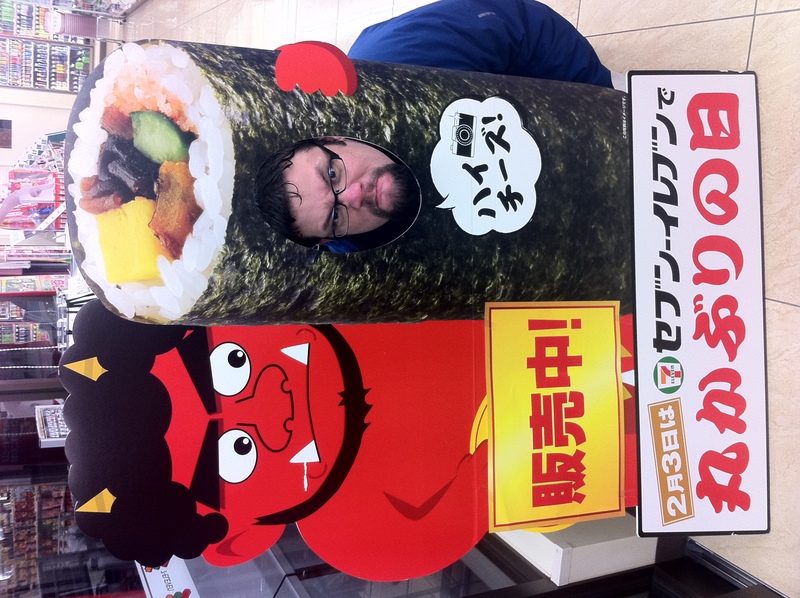 ), the delivery of enormous sushi rolls to the combini in morning, demon masks on the shelves…it’s real! It’s really real! Not just a dusty relic in a textbook for Japanese Culture 101! The other day one of my coworkers came in with a bag full of beans and candy. A few of the other teachers then delighted in explaining the holiday to me, and were surprised at how much I already knew. I even got invited to join the Archery club’s celebration this afternoon! I had a prior engagement, so I couldn’t attend, but it was nice to be asked. Interestingly enough, they apparently celebrate without Oni, just throwing the beans at the door to shoo away demons. The teacher in charge was also apparently planning to mix the candy in with the beans, which I had never heard of. That’s another joy of being here–learning new things that hadn’t been in the books or the blogs I’ve seen. I also love seeing new traditions emerge and change. For example, instead of an Ehoumaki, the uncut sushi roll, why not try a dessert version? 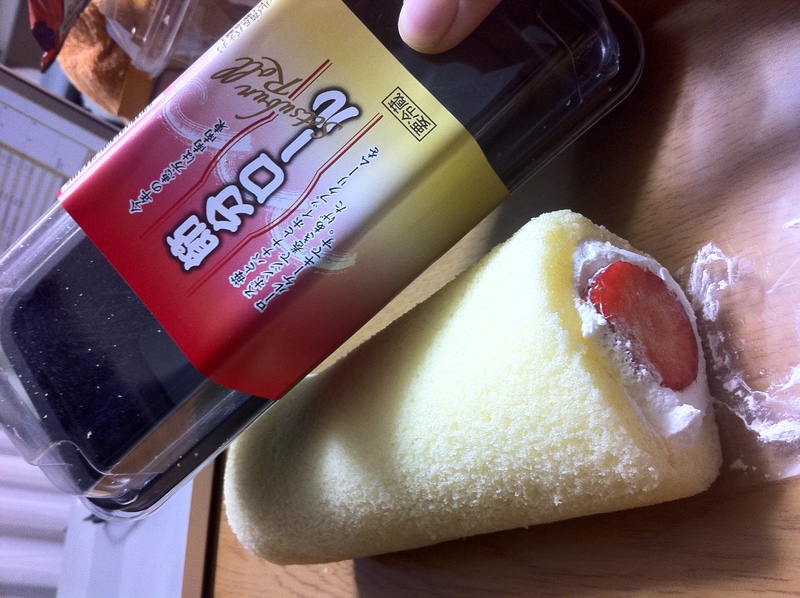 This extra long uncut roll cake is filled with strawberries and whipped cream. Much more exciting than seaweed and rice, don’t you think? ^^ Would you rather try the traditional sushi, or the cake version? Have you heard of Setsubun? Would you like to celebrate it? You can learn more about it over on Wikipedia! This entry was posted in Modern Traditions and tagged beans, cake, combini, culture, ehoumaki, fun, holiday, Japanese, oni, Setsubun, sushi, tradition. Bookmark the permalink. thank you for your cool submission to the japan blog matsuri. hmmm, hard choice between the eho-maki and the extra long uncut roll cake filled with strawberries and whipped cream. the dessert version looks so much more appealing though! Thanks for sharing. Last time I threw beans was like 5 years ago! The only plays I throw them now is in pot.